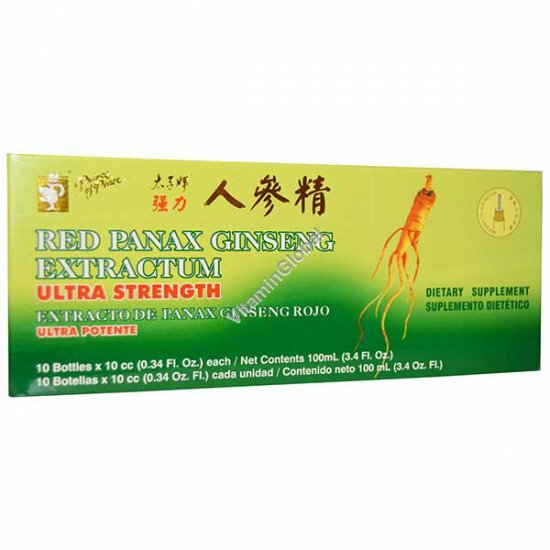 Chinese Panax Ginseng, the root of Araliaceae, is a precious natural plant growing in the northeastern provinces of China, where the best quality ginseng in the world, the wild Imperial Ginseng, is found. Suggested Use: Tear off the gold seal on vial, lift the white lid gently before pouring content of 1 vial into a cup of hot or warm water for tea 1 vial per day. Ingredients: Red Panax Ginseng Extract in a Honey base, alcohol less than 0.5%. Warnings: Not for children and pregnant women's use. Content: 10 ampoules per box, 10ml each.